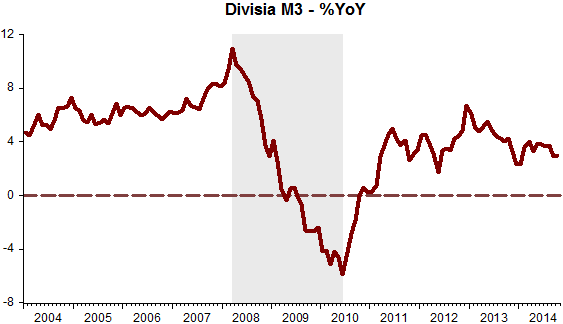 I thought to myself: Instead of writing about the difficulties in measuring “economic slack” in this “new economic order”, why didn´t they spend some time trying to understand the reason for the joint occurrence of “deep recession and financial turmoil”? The Long Boom description of the post 1984 economy was coined by John Taylor in 1998 and followed the Fed´s “Taylor Rule-based” monetary policy. Later it was renamed by Stock and Watson “The Great Moderation”. 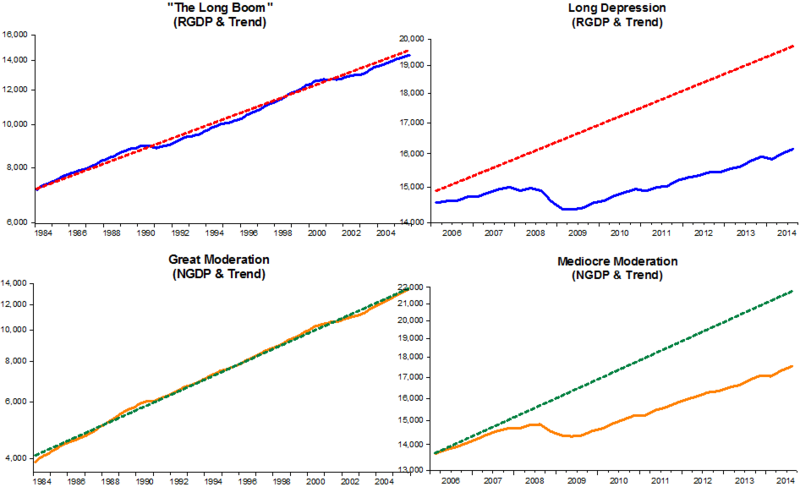 The “Long Depression”, likewise, could aptly be called “The Mediocre Moderation”. In charts, both the “Long Boom” and “Long Depression” and the associated behavior of monetary policy reflected in the “high” and “low” paths of NGDP. The moment the Fed went all-in for the bail-outs the rest of the economy tanked. It´s not as Hummel has it, “with almost no impact on the effective money supply”, but with a very large negative impact, even stronger than it appears given that money demand was increasing fast! I have earlier argued that the development in NGDP looks as if the Federal Reserve has had a 4% NGDP level target since Q3 2009. In fact at no time since 2009 has the actual level of NGDP diverged more than 1% from the 4% trend started in Q3 2009 and right now we are basically exactly on the 4% trend line. This is remarkable especially because the Fed never has made any official commitment to this target. With market expectations fully aligned to with this trend and US unemployment probably quite close to the structural level of unemployment I see no reason why the Fed should not announce this – a 4% NGDP level target – as its official target. PS I might join the hawks soon – if the trend in NGDP growth over the last couple of quarters continues in the coming quarter then we will move above the 4% NGDP trend and in that sense there is an argument for tighter monetary conditions. PPS I am not arguing that monetary policy was appropriate back in 2009 or 2010. In fact I believe that monetary policy was far too tight, but after six years of real adjustments it is time to let bygones-be-bygones and I don’t think there would be anything to gain from a stepping up of monetary easing at the present time. It´s not, I think, a question of easing (or, as he says, “soon joining the hawks”) but of changing market expectations by a regime change (an NGDP Level Target). Market expectations, being “putty-putty” (not “putty-clay”), will very quickly adapt! There is a lot of discussion of how economic slack is fast disappearing, and I expect a lot of push on this view, given continued rapid growth in GDP as reported in today’s second release for 2014Q3. This view seems counter to (1) the CBO estimate of potential GDP and (2) the slow pace of inflation. My suggestion is that there remains a substantial amount of slack out there. I like the idea of “given continued rapid growth in (R)GDP. In fact RGDP growth has been “monotonously” slow, clocking an average 2.2% since Q2 2010! There are many sad aspects of the Great Recession, perhaps the saddest is the defeatism that has afflicted economists. We are to believe, just as in Japan, that robust economic growth is a thing of the past. In truth Alan Greenspan was willing to risk some inflation in pursuit of economic growth. Today’s central bankers are unwilling to risk any inflation even close to targets.